Any kind of disturbances or uneasiness that is felt in any one of the 2 knee bones is known as the Knee Pain. The two bones are named as the femur, tibia. These 2 bones are connected by the ligaments, tendons, and muscles at the knee joint. Let’s explore in detail, what might be the causes behind the knee pain. The treatment vary depends on the cause of the knee pain. If you know the causes, there is a chance of taking the preventions. Several situations may cause Knee Pain such as Injuries, Improper treatments for the injury, as an increase in age. Injuries are the most common causes of knee pain and further knee diseases which may be caused if left untreated on time. Knee joint pain can be due to following reasons including Arthritis, Osteoarthritis Rheumatoid Arthritis, Bursitis, Tendinitis, Gout, and Pseudo Gout, Septic Arthritis, Strains, Sprains, and Injuries. Sudden Injuries – One may suffer the knee pain due to a sudden hit to an external object or a sudden unexpected fall may be the cause of knee pain. High impact activities – Some types of Sports or activities that may show a high impact on knee joints may result in knee pain. Too much Body Weight – Obesity or overweight might be the other major cause behind the knee pain. Ineffective Nourishment – Our body requires to be nourished on daily basis for maintenance of healthy joints. An insufficient diet may also result in knee pain. For example, our body needs calcium to maintain healthy bones. If the requires amount of calcium supply is lacking in our daily diet, that may be the one of the cause for knee pain. Lack of Muscle Flexibility – Lack of flexibility in the knee joints due to a sedentary lifestyle, or lack of proper exercise to the body joints can become one of cause for knee pain in later ages. Medical conditions – Some health issues like arthritis, osteoarthritis, rheumatoid arthritis may also be the cause of severe knee pain in elder ages. Symptoms represent the occurrence of the issue. Here is the list of signs of the Knee Pain and joint issues. What is the Best Exercise for Pains of Knees? Knee pain is very common these days. The life is very mobile and hectic in the present scenario of the individuals and therefore a lot of people are facing the problems of joint pain and knee pain. Allopathic medicines are what people resort to when they feel any sort of discomfort or pain in the knee but it is always better to choose if there is any natural remedy for treating such common issues before opting for the medicine. If we have to choose the natural remedies, yoga could be of great use when done every day on regular basis. Let’s check out some helpful yoga asanas for knee pain relief. Yoga is a 5000-year-old Indian body of knowledge. Yoga is a group of physical, mental, and spiritual practices or disciplines, though many think of yoga only as a physical exercise where people twist, turn, stretch, and breathe. Yoga helps our body immensely. Yoga improves the level of concentration and the way of looking at things. Yoga is not just an exercise, but a lifestyle. There are a number of benefits that yoga has on your mind, body, and soul. Other physical benefits of yoga include improving respiration, energy, and vitality. Yoga is very helpful in improving the overall metabolism of the body, to support healthy body weight and to improve athletic performance. Exercises, healthy diet and yoga are 3 important pillars of the holistic approach towards a healthy body and a healthy mind. Can Yoga help with knee pain? The answer is a positive yes. One has to perform these yoga asanas mindfully. These yoga asanas help prevent knee problems and associated disease conditions. Want to remain fit and flexible always? Having Weak Knees? Do some Yoga. Tadasana could be the best yoga pose to start with for the beginners. Tadasana could help in increasing the flexibility of muscles and strengthen the joints like the thighs, knee joints, and ankles. Tadasana could be practiced to treat and for better results in joints and knee pain related problems. Tadasana is usually the starting position for all the standing poses in yoga. But it’s useful to practice Tadasana as a pose in itself. 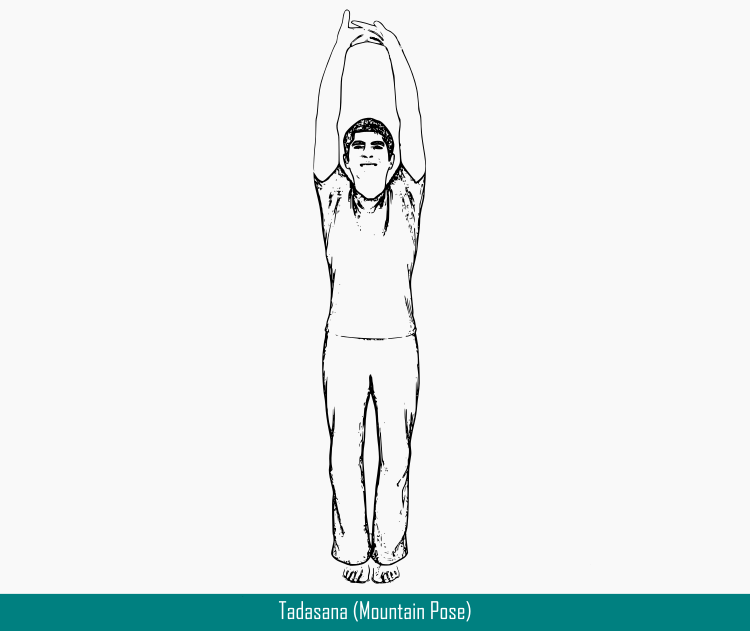 Tadasana yoga pose is effective to increase height and stretching your body from feet to your arms. Stay in the pose for 30 sec to 1 min, breathing easily. Practice 5 rounds. For beginners, it may be difficult to maintain balance but with practice, it becomes easier. Tadasana asana improves posture and develops balance. It strengthens the muscles of thighs, knees, ankles, abdomen, and buttocks, Relieves sciatica, Reduces pes planus (flat feet). Triangle Pose is also called as Trikonasana. 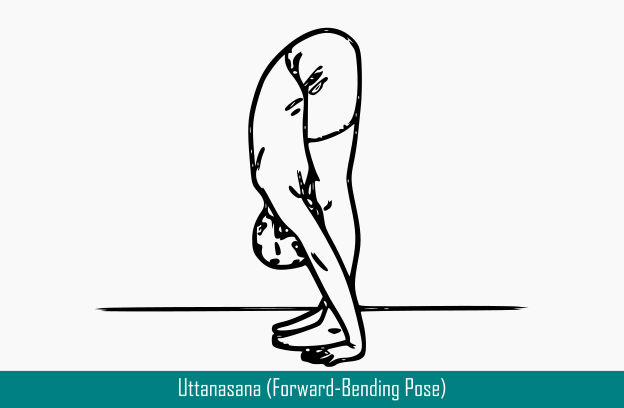 The name Trikonasana comes from the Sanskrit words trikona which means triangle. 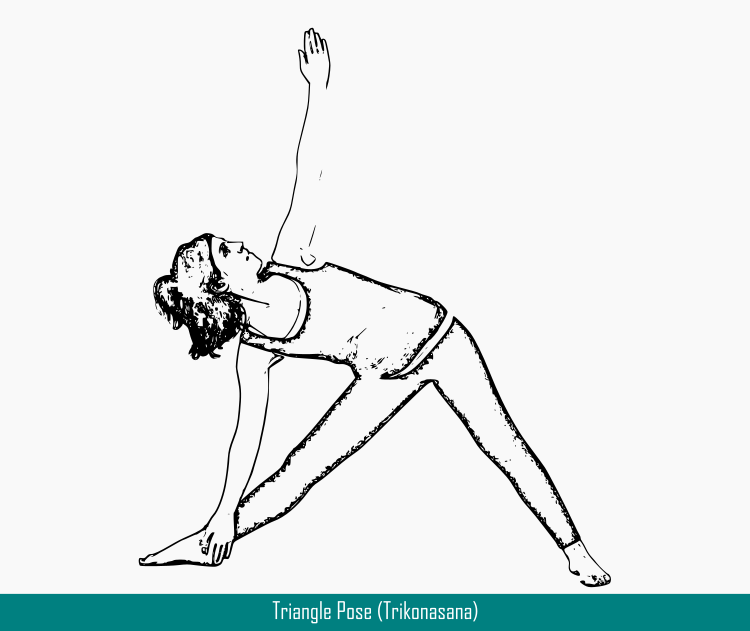 Triangle pose is a yoga pose that stretches the legs and creates balance. Trikonasana is extremely beneficial to burn fat from stomach, waist, thighs, and back, so it helps in obese people to lose excess weight which may be causing the knee pain. Trikonasana is one of the key standing pose found in most styles of yoga. This yoga asana is energizing and works on the waist, hips, and legs, thereby helps to reduce the knee pain. Hence could be practiced as one of the yoga asanas for knee pain relief. 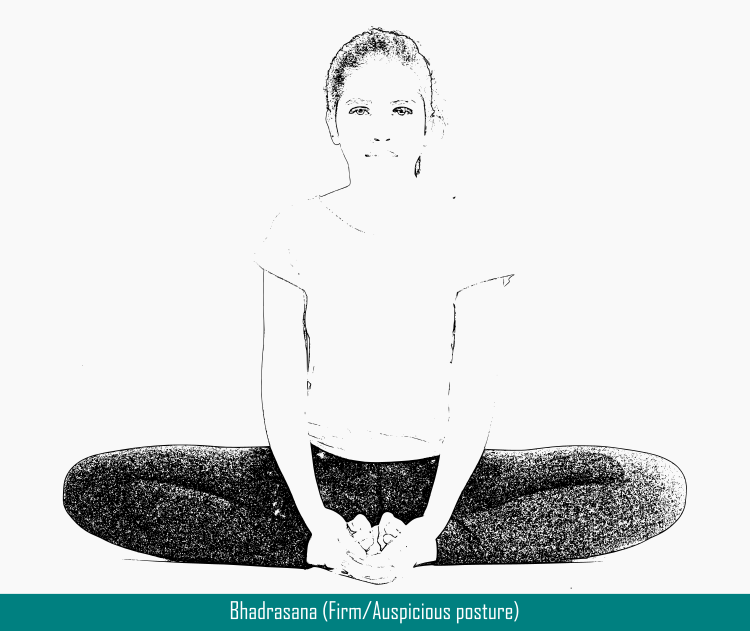 Stay in the pose for 30 sec to 1 min, breathing easily. Practice 5 rounds. For beginners, it may be difficult to maintain balance but with practice, it becomes easier. Stand with your feet parallel and hip-width apart. Fold forward slowly while exhaling. If your hamstrings are tight or your lower back is sensitive, bend your knees. This yoga asana helps to stretch hips, hamstrings, calves and also strengthens the thighs and knees, therefore helps in reducing the knee pain involved due to weak muscles groups in the legs. Note: Stay in this posture for 30 sec to 1 min. VRKSH means tree. 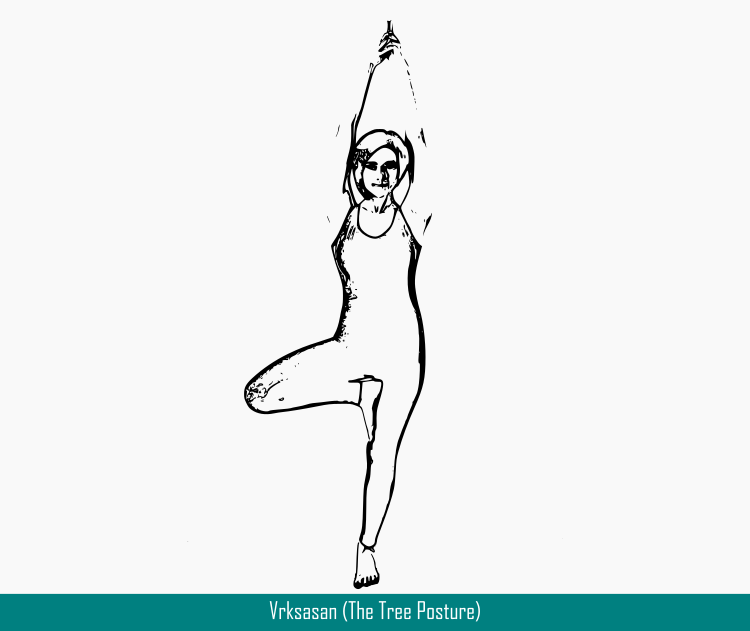 The final position of this asana resembles the shape of a tree, hence the name. VRKSASAN improves neuromuscular coordination, balance, endurance and alertness. It tones up leg muscles and improves and rejuvenates the ligaments also and hence may be used as one of the yoga for knee pain relief. 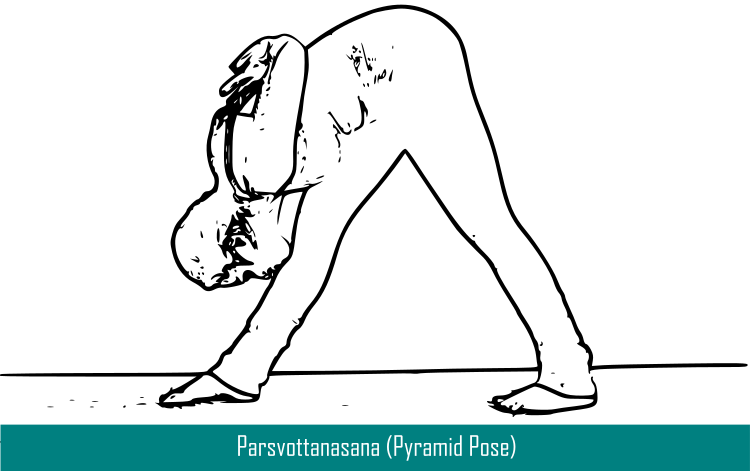 Parsvottanasana or pyramid pose in yoga helps to build balance in our body, strengthens the legs and also helps to calm down the brain. This yoga pose is also very much useful for the overall joints health including the knee joints. Regular practice of pyramid pose helps to reduce knee pain, hence could be considered as one of the beneficial yoga asanas for knee pain relief. Sit on the floor with straight legs. Now bend your knees, bring your feet together so that the soles touch each other and pull them with the hands towards your body, close to the perineum. Grab your feet, sit straight, relax your shoulders and smile. Bhadrasana yoga posture strengthens the muscles of your thighs, hip and buttocks. This asana can be used as a yoga asanas for knee pain relief as it improves flexibility and reduces knee pain. Having held the head with the two arms, one lies down on the ground facing downwards, chest touching the ground, two legs spread apart. This posture is called the Makarasana. This asana is advised for getting relief from knee pain because in this posture you have to keep your entire leg straight, which ensures proper blood supply to the knees. Knee support aids like knee caps may help to provide warmth to the knee joint and mild compression to the knee which would help the pain and inflammation that may be seen with the age, arthritis. General Healthy knee joints, knee joints health, knee pain, knee pain exercises, yoga, yoga asanas for knee pain, yoga for knee pain, Yoga poses for knee pain. permalink. Much informative article on use of yoga for knee pains. Most of us get joint pains. It’s fine if that subsides with regular exercises and best posture habits. But if the problem continues, a visit to an expert is much needed and right diagnosis at right time can help in solving the issue. Some other benefits of yoga in daily life. Much educational article on the utilization of yoga for knee torments. The vast majority of the general population having the issue of joint torments. It’s fine if that dies down with consistent activities and best stance propensities. Thanks for sharing very information post. it would really very helpful.